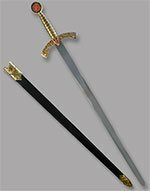 Often this was the weapon of choice of the medieval knight. It was commonly used during the middle ages. It was weilded with one-handed, allowing the knight or soldier to hold a shield in their other hand. The knight and his arming blade were inseparable. 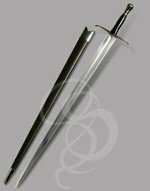 Though a knight might switch other instruments throughout his life and even during a single battle, the arming sword was his for life. In fact, it was likely that a knight would go through more wives than arming swords, and, when you consider that they were often handed down from generation to generation, it's quite possible that an entire family tree would use the same blade. 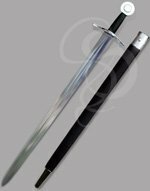 The Sword of the Templar Knight is a highly ornamental with a beautiful pewter colored metal hilt featuring a golden cross in the pommel and embedded golden colored coins in the grip and guard embossed with various designs of religious significance. The knight and his arming sword were inseperable. 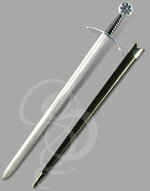 Though a knight might switch other weapons throughout his life and even during a single battle, the arming sword was his for life. In fact, it was likely that a knight would go through more wives than arming swords, and, when you consider that arming swords were often handed down from generation to generation, it's quite possible that an entire family tree would use the same sword. 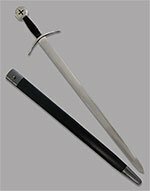 Because of this, arming swords were much more than just weapons. They became symbols of the men who carried them. Badges of honor, symbols of rank and nobility, and messages to all that the bearer was both a gentleman and warrior; that he could save your soul or take it in an instant. 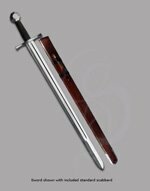 The relationship between the knight and his arming sword was similiar, if not so religious, as the relationship between a samurai and his katana. 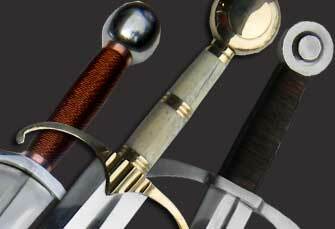 Knights would have sacred or other meaningful words inscribed into the blades of their swords, inlaid with silver or gold. These words served as both an inspiration and personal motto for them. Occasionally, knights would rent out space on their swords to local merchants, and would, with each kill, proclaim "This death was brought to you by Samuel's Bake Shop, where you don't have to spend a lot of bread to get a loaf" or something similar. Actually, I don't think those last two sentences are true, but it would have been a good way for the knights to raise money for their church, now wouldn't it? 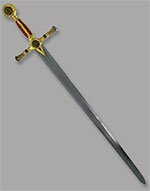 As mentioned, arming swords were handed down from generation to generation. 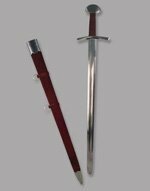 The swords, used in combat, often suffered damage or breakage, so the blade would be refitted, or a new pommel would be attached, or perhaps a new grip would be added to replace an old worn one. 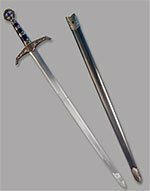 It's possible that the sword a great-great grandson bore no longer resembled the original. 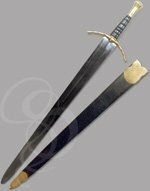 Arming swords in warfare were used mostly as backup weapons for lances and much larger battle swords. 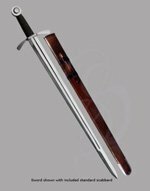 The knight woudl draw these swords when dismounted, or when his other weapons were lost or broken. 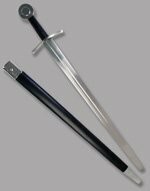 The arming sword, however, would have been used quite often in one-on-one combat and in smaller scale combats. 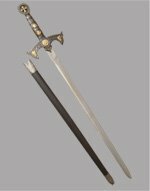 In some tourneys, knights would first joust with lances, then, when unseated, would draw their arming sword and continue the combat.